By Dennis W. Viau; modified from a recipe found in Food & Wine Magazine. I will try almost any recipe that involves lamb because I really love the flavor of the meat. I buy far more lamb than beef. The original recipe called for a lot of garlic. I chose instead to pair it with grilled and roasted vegetables. Heat the oven to 400°F (200°C). If the boneless leg of lamb is tied or bound with elastic netting, remove it and open (butterfly) the leg to expose the inner meat. Spread about 2 tablespoons of the honey on the meat and season with salt and pepper. Then season the meat with about 1 tablespoon of the herbes de Provence. Roll and tie the leg with kitchen twine. Spread the outside with honey, season with salt and pepper, and coat with the remainder of the herbes de Provence. Place the meat, fat side up, in a roasting pan on a low rack in the oven. Add the ½ cup red wine and an equal amount of water to the pan. 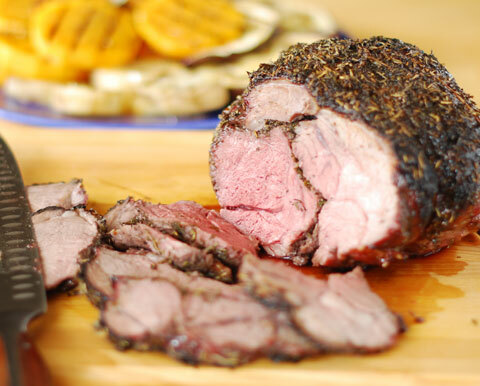 Roast to the desired internal temperature (125°F/52°C for rare, 135°F/57°C for medium-rare, or 145°F/63°C for medium). Check the roasting pan occasionally. If the liquid appears to be boiling dry, add a little more water. Remove from the oven and transfer the meat to a carving board. Tent with foil and allow to rest 10 to 15 minutes. The internal temperature will rise another 10 to 15 degrees Fahrenheit (or equivalent Celsius) to finish the cooking. Add the Marsala to the roasting pan. Heat over medium heat to loosen the fond (the brown bits) from the bottom of the pan. Strain the juice and skim off most of the fat. The liquid can be reduced in a skillet if the flavor is too mild. Use the juice as a garnish at the table. For a side dish I peeled and sliced butternut squash, yams, and white potatoes, which I grilled about 6 minutes on each side on a stove-top grill/griddle lightly oiled with safflower oil. I then transferred the vegetables to a glass baking dish greased with clarified butter. The baking dish went on the lower rack of the oven to cook the vegetables with the lamb. I also put onion and eggplant slices on the grill, seared bar marks in them, and then reduced the heat below the grill to low to complete the cooking. The vegetables were arranged on a serving platter and garnished with extra virgin olive oil, salt, pepper and a little herbes de Provence.